Any blogging software is, generally speaking, pretty customizable. As a new blogger, you can decide a number of things about how your blog looks and works. You can control all this and more from the Control Panel - called a Dashboard. Most Blogging software programs work in a similar fashion, and if you know how Blogger works, you can be pretty confident in making similar choices for other platforms. Blogger divides it's settings into separate areas: Basic, Publishing, Formatting, Comments, Archiving, Site Feed, Email, and Permissions. We'll cover some important bits from each of these areas. You can access all the sections via the Dashboard. On other platforms, the Dashboard might be called the Control Panel, Admin Panel, or something similar. To get to the dashboard, just log into Blogger. If you're already logged in, look for a link to the Dashboard in the upper-right corner of the page. 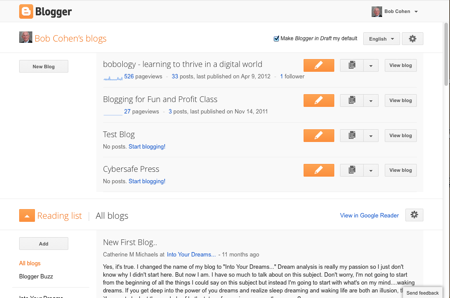 The Dashboard shows all of the blogs you have with Blogger, and for each Blog you can quickly start a new post, or edit old posts. A single click takes you to individual blog settings, stats, or templates. If you make any changes to any of the settings pages, make sure to click 'Save Settings' at the bottom of the page to have the changes take. Labels: #Blogger, #BloggerLayouts, #Blogging101, #GettingStarted, #HowTo, #Settings.